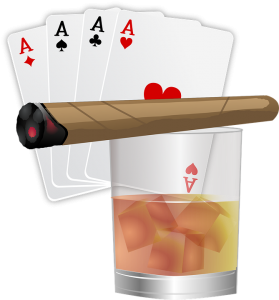 The GLCPS&L Society will take two to three hours twice each month to play poker, smoke stogies and explore alternatives to truth in such endeavors as fishing, politics, love life and philosophy. A secret location known only to the GRRs (usually a cigar store with indulgent ownership). You must be willing to lie, smoke stogies and afford to lose money at poker in no particular order. You do not have to know how to play poker, we will teach you really good, honest! You have to have a certain quality about you. We can’t tell you what it is but we will know it when we see it, and more importantly, if we don’t. The stakes are not going to be high – Nickel, Dime and Quarter. Limits will be set if need be. The objective here is not wealth of purse. The objective of this society is wealth of experience and company. Meetings will be held twice each month. No dues will be taken nor minutes. We will do no good to our fellow man, livers or lungs. If you are a DREG, you may be granted an audience by which you may come to a meeting, buy us all drinks and lose your money without complaint. These grants are expected to be much sought after and begging will be considered favorably. But knowing the Riff Raff, bribery will work better. Dress Code – Unless absolutely necessary, dresses are not required. Casual, slovenly or costumed dress is all OK. Assignment of Rank is permanent unless we change our minds. When we need to or feel like it, we may change the rules but probably not after the cards have been dealt. What happens at society meetings stays at society meetings. All Gifted Riff Raffs and DREGs are sworn to secrecy unless it becomes a really funny story, then it’s ok to blab. We play Dealer’s choice – whomever deals calls the game to be played. No money at the table. We will handle payments offline. Sammy will supply the cards (pre-marked) and chips…all we have to do is buy our beer, wine and stogies during the game from Sammy. This is a private game being played in a public location. Participation in the game is by Society invitation only. You may invite spectators as you like. Cell phones, PDAs and the like are to be turned off and preferably left in your cars. No talking about work, unless it is to shameless lie about a co-workers parentage or other such non-sense but nothing productive will be tolerated. The meetings will start promptly at 6pm. If you are late, your buddies will ante up $.25 per hand for every hand that you are not there to protect your chips to a max of $5.00. A hand consisting of 3 pairs, while often interesting, does not usually win much of anything unless its the opportunity to shuffle or deal the next sometimes, depending upon where you are sitting in the rotation. Recently, we discovered that we were technically and spiritually limited in our ability to account for our individual performances in a monetary fashion. Technically, we failed to install adequate safeguards for the data. But more importantly, spiritually we never really cared that much about the money. So The GLCPS&L Society decided to donate what money we did have to hurricane relief and stop pretending to maintain any books at all. We will find some other way to recognize the winners and losers.